It’s a trick question, because any reason is valid, and are as varied as the practitioners. Karla Bock started taking yoga eight years ago because she thought it may help her deal with the death of her mother. Karla was no stranger to exercise. She’s an instructor at UW Health’s Sports Medicine Fitness Center and a four-time Ironman competitor, but the many miles she logged on her bike and in the pool could not provide for her the mental serenity yoga did, and does. Soon she was practicing three or four times per week at a local studio, and two years later completed instructor training. 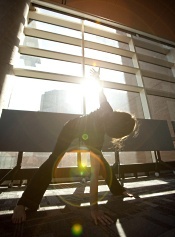 She now teaches a power flow vinyasa yoga class at UW Health Research Park, but recommends a full exploration of options for newcomers looking to start their own practice. The vinyasa – Sanskrit for “flow” – class Karla teaches is more movement-intensive, with a series of poses and an emphasis on breath. It’s similar to but more varied than ashtanga yoga, which always employs the same sequence of poses. Restorative yoga, by contrast, focuses more on relaxation and rejuvenation, while hatha yoga serves as a general introduction to practice. No one style is right for everybody. The key is creating the practice that is right for you. If you practice hot yoga, make sure you don’t overextend yourself. The heat encourages flexibility, which can tempt you to go deeper into poses than you should. Listen to your body. Your practice can – and should – vary from day to day, depending on how your body feels. If your breathing is labored during a pose, that pose is not for you. Try a less strenuous one. The Internet is a good place to start, to research the styles you suspect may appeal to you. (There is plenty out there. A “yoga styles” Google search returned 51 million results.) Find a class that’s conveniently located and meets at a time amenable to your schedule. A few instructors cater their offerings to newcomers hoping to learn more about the kinds of practices available, with “Yoga 101” workshops that provide a general introduction, Karla says. Or, you could just go on vacation. That’s what Karla’s UW Health colleague, Juli Aulik, did. During a trip to Belize, Juli and her husband wound up staying at a yoga retreat, and on a whim decided to try a class. It’s one of yoga’s foundational tenets, and a concept that can be difficult to grasp, particularly for athletes accustomed to physical activity based on competition. That’s what Juli has accomplished. Her chance yoga encounter in Belize has blossomed into a daily practice that includes both classes and a home practice that incorporates poses she’s taken from her instructors and some online resources. She is also learning about how the placement of her hands in certain poses can impact the pose. “It’s been really fun to learn these nuances that add up to having a really different understanding of balance,” Juli says. Other benefits are less concrete, including an understanding of the self that has evolved with her practice. “It’s a process of discovery, of how the mind works with the body and how the breath regulates all of it coming together,” she says. That discovery is unique to each practice, and each person. Perhaps that’s one of yoga’s most enduring lessons and greatest traits.